There is something very majestic about diving in Milford Sound, New Zealand - in an area called Fiordland. You must first drive 2 hours over one of the most beautiful roads in the world over a mountain pass and through a tunnel. As your boat takes off, you look out at arguably one of the most picturesque views in the world. You dive through a layer of blurry ice-cold fresh water, which is stained with tannins from the forest trees, and when you reach the clear salt water huge trees of rarely seen black coral greet you. When you exit the water, giant waterfalls surround the boat. Yes, it is a truly majestic experience. New Zealand is one of the most, if not the most beautiful country in the world, and Milford Sound is one of it's highlights. Located in the southwest section of the south island in an area called Fiordland, Milford Sound is a giant fjord considered one of the top travel destinations of the world for its beauty. It is 15km long, and sheer rocks rise 1,200 meters on each side of the fjord. The Milford sound area is wet - very, very wet. Expect rain every day. 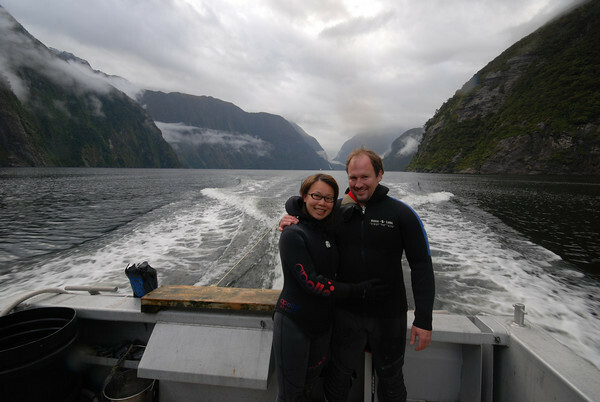 Happy to go diving in beautiful Milford sound! 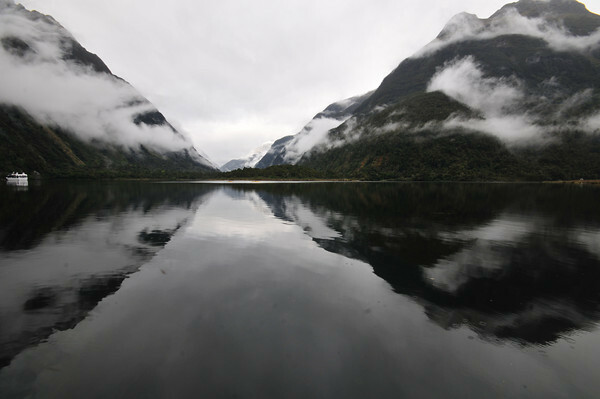 Milford sound is covered by an extremely cold layer of fresh water 2-6 meters deep. Below that is very cold (12-15 Celsius) salt water filled with life. 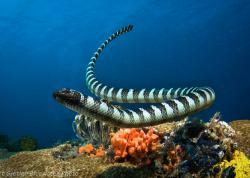 Once I was underwater, I found the diving fairly easy, with no currents. The diving consists of walls and slopes, and we did most of our diving in the 30-60ft range. The bottom is very, very far away - hundreds of feet deep or more. You will see large black coral trees, usually 1-3 meters high, but they can grow up to 5 meters high. 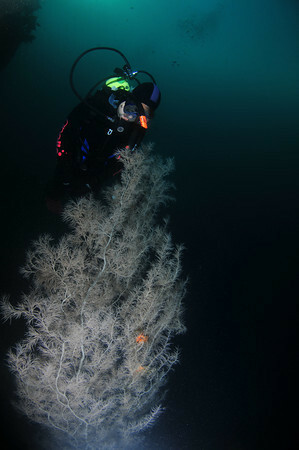 Black coral, Antipathes fiordensis, is actually more whiteish, with a black skeleton. 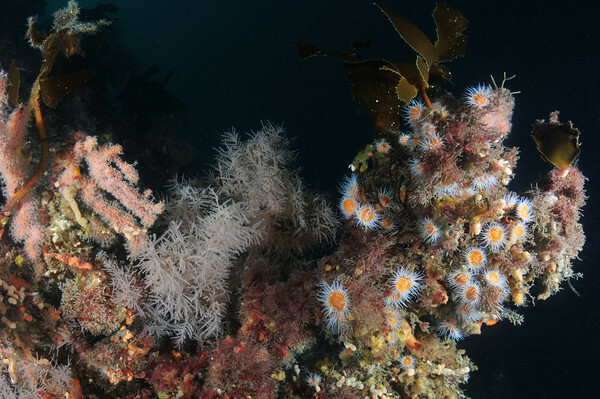 This coral normally is found at very deep depths beyond rec diving limits, but in Milford Sound it can grow very shallow, at 10 meters. 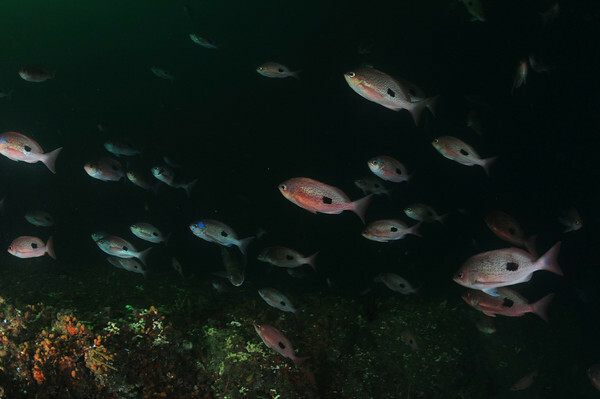 The fresh water layer at the surface reduces the amount of light found underwater, resulting in deeper-water species thriving in shallower water. At some dive sites New Zealand fur seals are common and may swim by you. 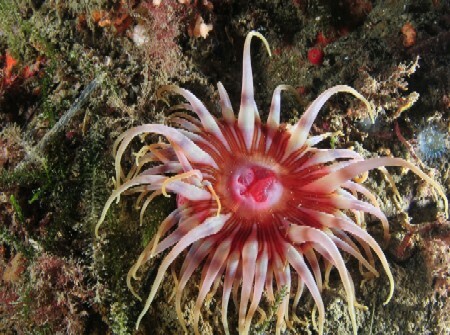 While scuba diving Milford Sound I saw nudibranchs, starfish, lobster (crayfish in New Zealand), small featherstars (Crinoids), Tunicates and anemones - all were common, as are many other invertebrates. You can usually see several nudibranchs on the walls. There are small amounts of red coral a little deeper. 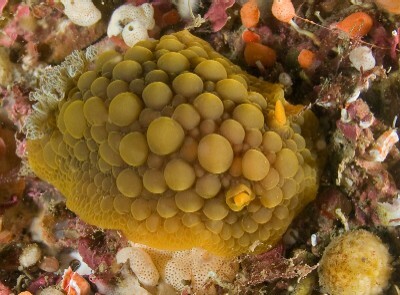 The richness of invertebrate life reminded me of some of the colder dive sites in Southern California. This is also a place where you can find Brachiopods, also known as Lampshells. There is also kelp, but it is not giant kelp forest but smaller kelp that grows in shallower water. There was also a good diversity of fish and some schools, but don't expect to see large fish or giant schools. 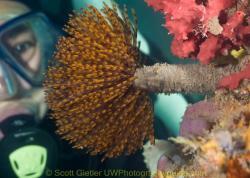 If you are very lucky you can see an octopus, spiny sea dragon (you must be very lucky), or spiny dogfish shark. I did have a nice encounter with a rather large octopus on a wall, and a shark did quickly pass by us. Penguins can be seen on the surface at certain times of the year. 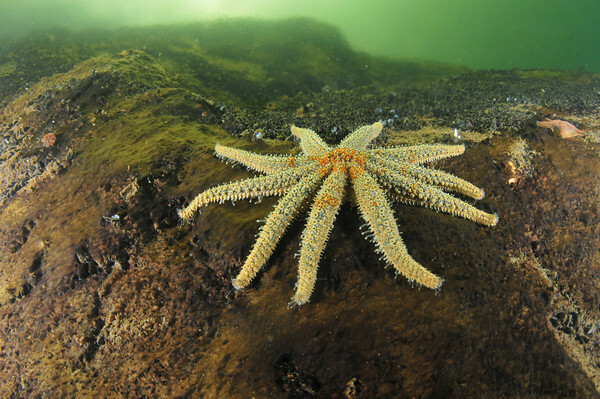 Here's some good reading on Fiordland marine life. 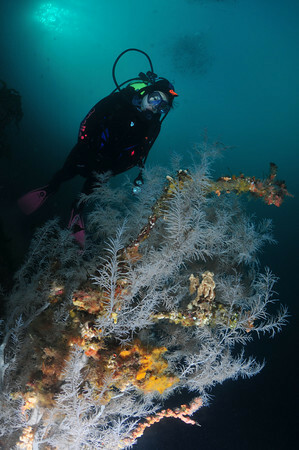 Our first dive was at Penguin Cove, which is more of a beginner site and can be a little silty. 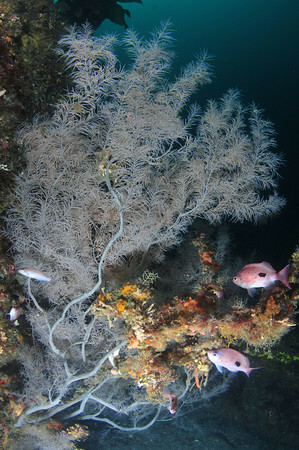 Still, there was a good amount of marine life and plenty of black coral. 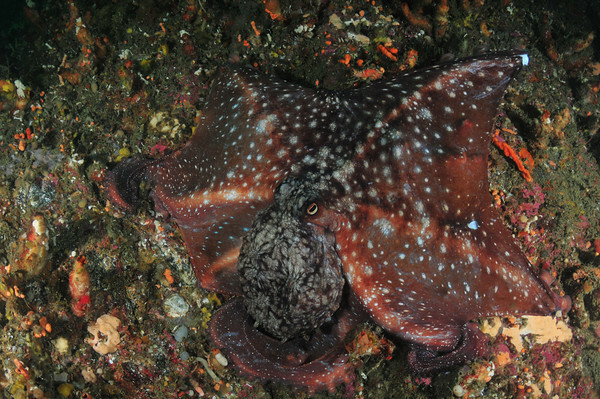 Our second dive was East Seal Rocks. This site had fur seals, and lots of macro life. I'd love to return to this site again! Very few people actually stay in Milford Sound, most stay in nearby Te Anau. Which means after the dive, you must drive over a mountain pass. The nearest decompression chamber is very very very far away. Basically, you don't want to get bent here. Because of this, the dive operation limited us to 2 dives, 25 minutes each, and we had to wait 4 hours before driving over the mountain pass. If I had to dive Milford Sound again, I would spend the night after diving in Milford sound proper. This way I would not have to worry about limiting my dive time, and driving over the mountain pass. 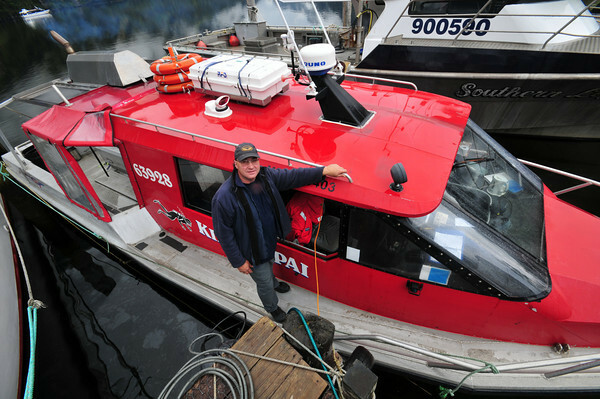 Ideally, you would make arrangements with the boat to do 3 long dives, and then spend the night. The divemaster would most likely also spend the night so you may have to cover his expenses as well, but I feel that it would be worth it. The dive operator I used, Tawaki Adventures, was very professional. 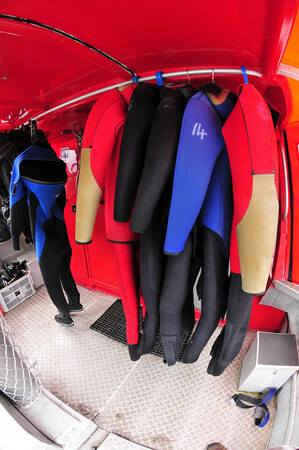 The boat was comfortable, and had a good selection of high-quality gear on board, including cold-water wetsuits. I did not bring any dive gear on this trip except for my mask, so I used all of their gear. Everything worked well and I was not cold underwater in the two-piece 7mm wetsuit. My only regret was that I did not bring my own stiff fins. Most rental fins are meant to be easy to fin with, which is not what photographers want, because they silt up easier, and make it more difficult to turn. The captain was pleasant and did his best to make the trip fun. 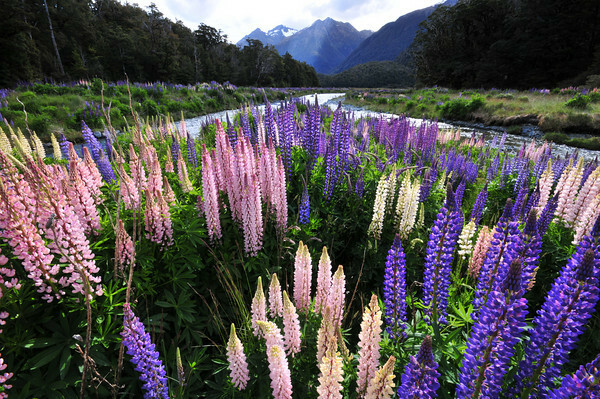 Including with the dive package is a tour of Milford Sound, which you would normally do anyways and have to pay for. Snacks and delicious hot soup is served on the boat. After the dives you take a small boat onshore (singing the entire way) for an "adventure" that includes sitting underneath a waterfall (which also washes the salt water off the wetsuits). 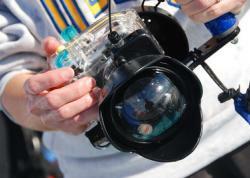 The divemaster, Alex, is a real pro with thousands of dives under his belt. More importantly, he knows how to deal with beginner divers, or divers not used to cold water. Even though my wife is an experienced cold water diver, she wasn't prepared for the surface temps, and felt a little panicked. Alex made her feel at ease and brought her down, and she was fine and had a great dive. I haven't dove with non-photographers in quite awhile. 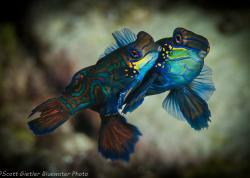 When my wife and I dove with Alex, he was also leading 4 other divers who were not doing underwater photography. They seems to all move at lighting speed, and everytime I stopped for a photo they swam out of view. Note to self - don't attempt this again! Posing with the Divemaster, Alex - with some beautiful scenery. 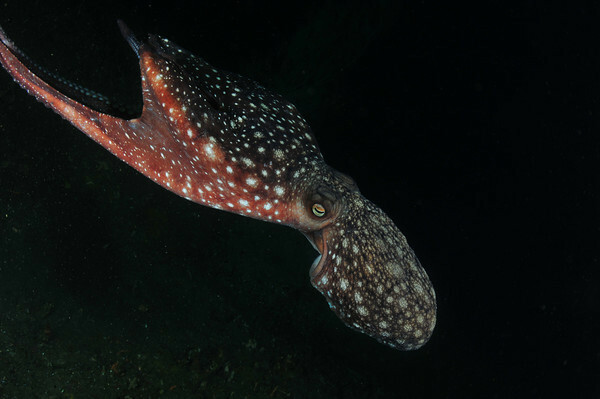 The diving season in Milford Sound is October to March. We dove in early November and had a beautiful day, but it is usually overcast with rain. Don't let this stop you from diving! The salt water you will dive in is 12 degrees Celsius in October, and slowly warms up hitting 14 degrees as you get close to March. The thin layer of fresh-water at the surface is a bone-chilling 8 degrees Celsius. Vis is usually not great, but not awful either. I'd say we had 10-12 meters on our dives, which is the norm. Right after a big rain it can get down to 4 meters or even less, but on some days it can open up to 15 meters. You can fly into Queenstown, New Zealand (or drive from Auckland - give yourself 10 days to experience the journey). Te Anau is a easy 2 hour drive from Queenstown. From Te Anau, the windy drive can be as quick as 90 minutes, but you can easily spend 4-6 hours taking in all the sites, mini-hikes and photo ops. We stayed in Te Anau, at Accomodation Fiordland cottages. As a bonus, the owner's husband is a very good nature photographer. The cottages are modern, beautiful inside and we highly recommend them. On both my dives I took my wide-angle Tokina fisheye lens, so I could try to capture larger scenes of the diving environment. Very close-focus wide angle works well in Milford Sound. There are also plenty of macro subjects. Watch your depth, wear stiff paddle fins to deal with silt, and dress very warmly. Keep in mind many subjects will be on a wall. Black coral, and butterfly perch. 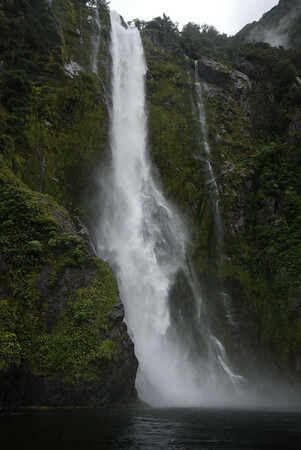 One of the dozens of waterfalls in Milford Sound that awaits you after your dive. Submitted by Sean (not verified) on Tue, 2010-11-02 14:14. Great review and I will have to do it one day once I can bring myself to enter the freezing waters of New Zealand. Just a note that what the reviewer probably wanted to say was "Te Anau is a easy 2 hour drive from Queenstown (171KM away)" and not " Te Anau is a easy 2 hour drive from Auckland (1702KM away)"
Submitted by K:-) (not verified) on Mon, 2010-03-22 21:45. Another nice report, with great fotos, Sko-T! Submitted by Janna (not verified) on Mon, 2010-03-22 19:58. 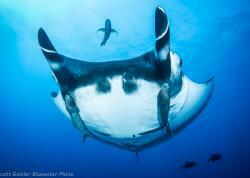 Great review and interesting marine life! I love how things look similar, but are slightly (and even drastically!) different than our usual critters.